These are light, full-flavoured sticky buns that have had slow rises to give a far greater depth of flavour. Small pieces of dried cranberries, juicy raisins, ginger and vibrant bursts of citrus run through the sweet, spiced dough. 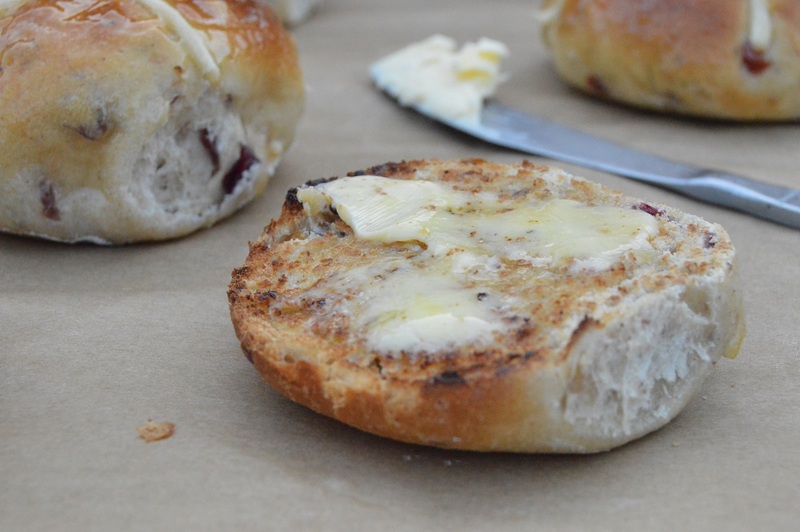 These buns are excellent split in half, toasted and buttered (and these call for salted butter!). I have turned up the flavour somewhat with the citrus and with the ginger, but they are not shockingly “in your face”. The punch of ginger and the orange is, I think, terrific and give hot cross buns that are shouting for attention! 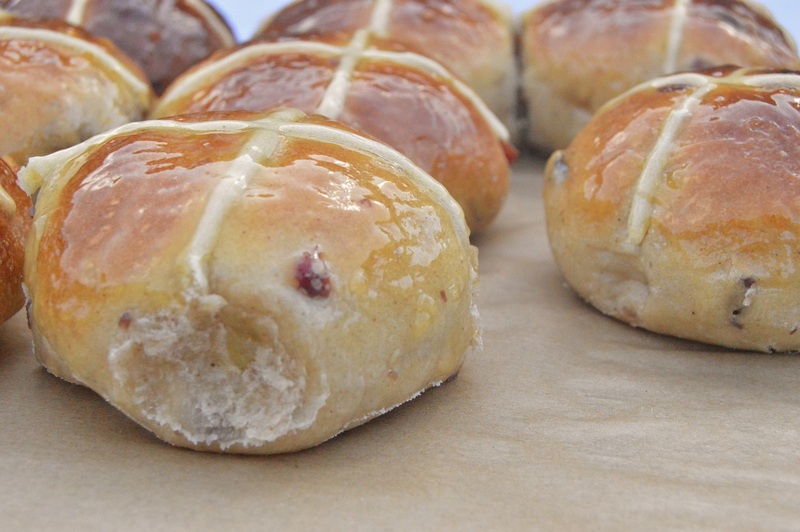 This is an adaptation of a handed-down recipe for standard fruit teacakes that I have been using for many decades that I make at several times during the year (without the crosses). As I am often inclined to do, I like to tweak it a little more from time to time: different fruit, sometimes more gingery with chunks of dark chocolate, and often soaking the fruit in hot tea….. But whatever tweaks you want to go for, up to about 150g added goodies to the main dough is about right. I like to make my version of mixed peel by using fresh orange and lemon rind, chopped up and then gently simmered in a syrup of sugar and water for about 20 minutes. However, a good quality commercial peel works well. 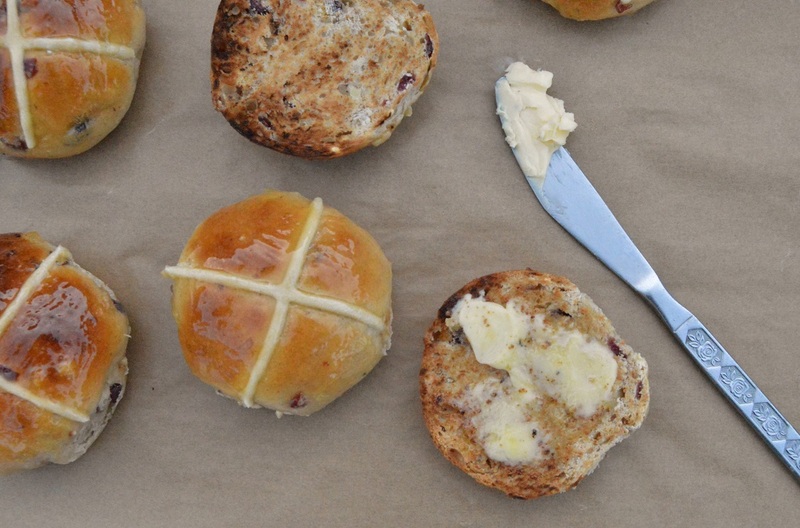 hot cross buns with attitude! There really shouldn’t be any urgency with bread: a bread dough needs to be allowed to rise at a sedate pace if its flavour is to develop. And it will wait quite happily for us to step in for the shaping, proving and baking at our convenience. With breads, quick rises are rarely for me: slow rises are the best way to get real flavour into the dough itself, regardless of the goodies being added to it. Once kneaded, I often place the dough in the fridge for several hours or even overnight. *I often mix the fruit with strong, freshly brewed Earl Grey tea and leave to steep overnight, for added flavour. Not essential, but I love it! (1) Mix the flour, salt, sugar, orange zest, yeast and the spices together in a large bowl. Add the whole egg, the butter and enough of the warm milk to form a soft but not unmanageable dough. (2) Knead well about 10-15 minutes until it becomes elastic and smooth. Cover with clingfilm and leave to rise until almost doubled in size: you can pop the dough immediately in a warm place but for the best flavour put it in the fridge overnight to slow down the rise. (3) Turn the dough onto a lightly floured board and work in the rest of the ingredients (fruit, ginger etc…) knead until it is smooth: the heat of your hands will warm up the dough if it had been chilled. Divide into 10 equal pieces and shape into smooth balls of dough. (4) Place the balls on a baking tray lined with non-stick greaseproof paper, spacing them a little apart so that when they rise, they will be touching. Cover with clingfilm and leave at room temperature (or in a warmer place) until well risen. (5) Preheat the oven to 180°C (fan). 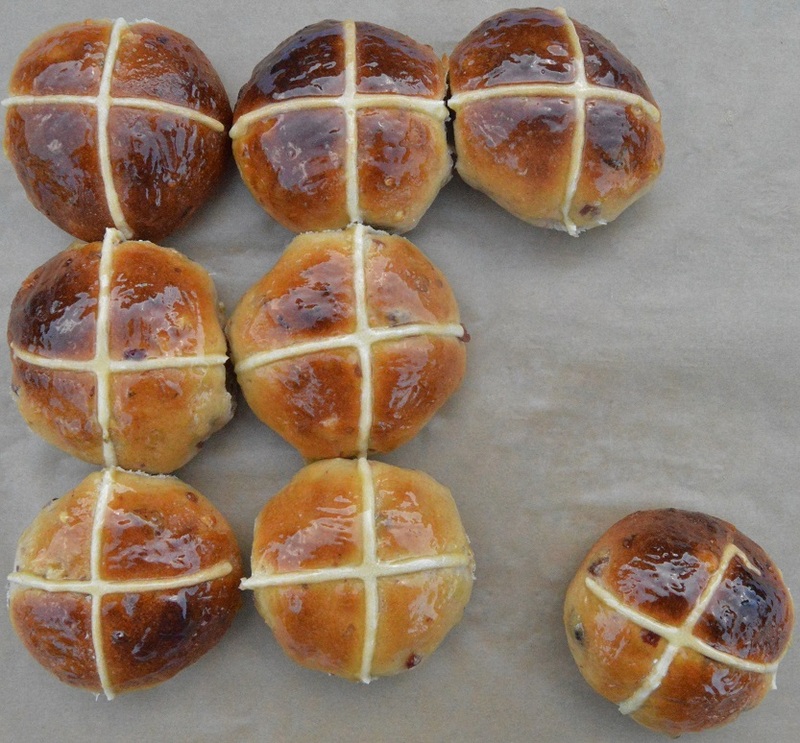 Meanwhile, make the crosses for the buns: mix the flour, ginger and orange juice to a thick paste, adding a little water if needed. Pipe a thin cross over the top of each bun and bake for about 20-25 minutes until golden brown. If the buns are getting too dark, place a sheet of greaseproof over them. (6) While the buns are baking make the glaze: heat the marmalade in a small pan or a pot in the microwave and stir in the whisky (if using). Brush the top of each of the hot buns with the glaze as soon as the buns come out of the oven and leave to cool completely. 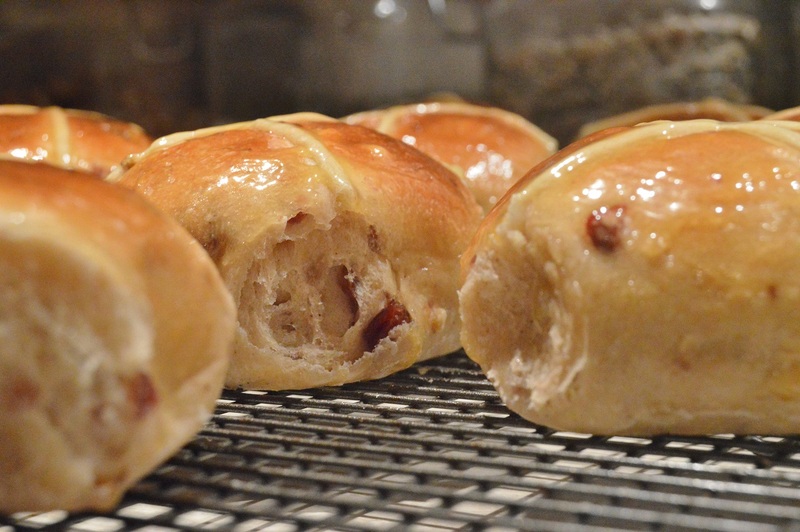 Gorgeous buns, and they sound delicious love everything in them.Happy Easter to you!! Woh! These look so yummy and so very lovely. a must for easter. Thanking you Philip. Happy Easter to one and all. Previous Previous post: Piccalilli: a prince among preserves!